With the holidays rapidly approaching, you may be doing a lot of menu planning. Many of the holidays have traditions surrounding food, and none more so than Thanksgiving. You may be already aware that there are many foods unsafe for your pet. 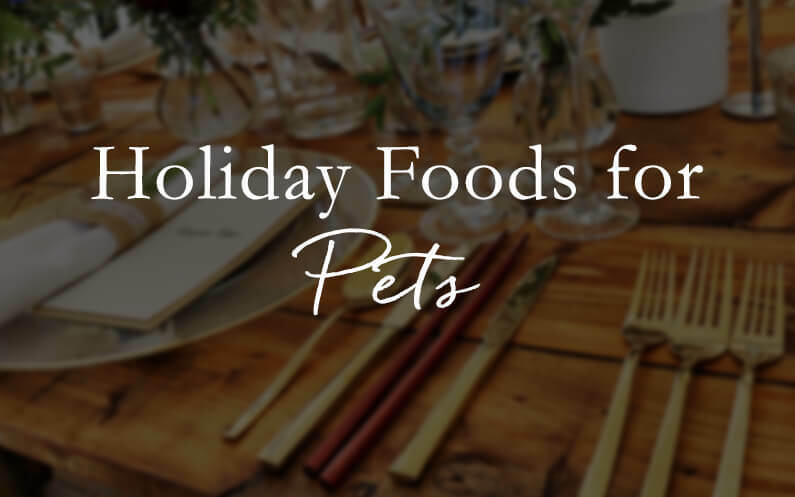 However, this list will show you that it is possible to prepare holiday food for pets that is delicious and safe for them. What would a Thanksgiving meal be without turkey? Luckily, the meat from this bird is safe for your pets as long as it is thoroughly cook. It should also be given without the skin. Of course, never give your dog the bones from the turkey. Bones can splinter easily becoming sharp weapons in your dog’s delicate digestive tract. In order to qualify as a good Thanksgiving food for pets, the turkey meat should be unseasoned. There are several traditional Thanksgiving vegetables that your pets can enjoy with you. Sweet potatoes are often a pup favorite. They are rich in many nutrients, such as Vitamins A and C, fiber, and potassium. Most dogs will gladly chow down on some raw or dried pieces of sweet potato. You do not want to give your dog the canned kind or any that have been baked with marshmallows. Most marshmallows contain Xylitol, which is toxic for dogs. Your pets also do not need the additional sugar that is often found in sweet potato casseroles. Want to make a home made treat for your pup for the holidays? Enjoy this recipe for a DIY Sweet Potato Dog Chew. Another great veggie to share with your pets is green beans. They are high in both fiber and Vitamins C and K. The trick here is to feed them to your dog while you are cooking up your green bean casserole. Your pet will much prefer the raw, crisp version over the finished product. If your secret green bean casserole recipe involves onions or mushrooms, it is even more important to not let your dog sample it, as these ingredients are toxic to them. This fall classic is often one of the first foods to make an appearance at the holidays. That being said, feeding your animals leftover pumpkins from Halloween is not advised and could make your pet very ill. You can, however, feed them pure fresh pumpkin. This holiday food for pets can be either raw or cooked, but it should not contain any added sugar or spices. The bread debate; should I or shouldn’t I? Dogs are not going to get much nutritional value out of bread (just like us). Feeding your pup small servings of white bread or dinner rolls from time to time won’t hurt them. It won’t help them either. Bread is a filler food and doesn’t contain any extra nutrients that they are not already getting from their daily dog food diet. There can be significant health risks, however, from bread dough or not fully cooked bread. The yeast in many breads, if uncooked, will continue to rise once it enters your pets tummy. Read more about bread and your dog here from the American Kennel Club. Many people know that raisins and grapes are dangerous for dogs. These mini treats pack a punch to your pups kidneys. Avoid them always. What many people do not know is that several types of nuts, in particular walnuts, are also very dangerous. For more information on nuts and pets, reading this article will help. This holiday food for pets should be approached with caution. There is a debate on mac and cheese in the pet community. Dogs and cats do not need a daily dose of dairy products. But some sure do love it! However, some pets, even cats, can become intolerant of dairy products. This is especially true in older pets. In these cases, even small amounts of mac and cheese could result in gas, vomiting, and diarrhea. You know your pet best, if their tummies can handle it, keep the treat to one small serving. Garlic and onion can make your dogs very ill. Even the powdered versions can wreak havoc on your pets body. Further, raw potatoes should be avoided as they contain an element toxic to animals; solanine. If your pet loves potatoes, be sure that they are fully baked or boiled (and cooled) before serving to your furry friend. Skip the salt and butter, too, for the best version for Fido. As always, for items that may affect the health and safety of your pet, consult with your veterinarian. If you have questions about holiday foods for pets or general questions about pet care, you can contact Kara Jenkins, Owner of TLC Pet Sitter. We are also available by email at info@tlcpetsitter.com. Why Not a Dog Park?